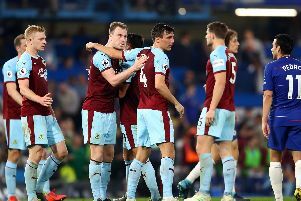 Burnley take on European opposition at Turf Moor as they round off their pre-season preparations for the 2017/2018 Premier League season. Celta Vigo, beaten Europa League semi-finalists, will travel to Turf Moor on Tuesday, August 1st (kick-off 7-45 p.m.), and on Saturday, August 5th, newly-promoted Bundesliga side Hannover 96 take on the Clarets (kick-off 3 p.m.). Tickets for both games are as follows - Adults £10, Over 65s/Under 22s £5. Tickets initially go on sale, exclusively to 2017/2018 season ticket holders, as of yesterday, with season ticket holders will be able to purchase their own seats and any seats linked on their account as friends and family.